Blue Jays GM Alex Anthopoulos tweaked the offense over the offseason. With Melky Cabrera outbound to Chicago and Adam Lind a little too pricey for his role, Anthopoulos added a double-threat catcher, top third baseman, buy-low outfielder, and a second base prospect. The team still has weaknesses which complicate the outlook. The rotation is thin after losing Marcus Stroman for the season. The bullpen might be a mess with only one established, high quality reliever. Second base could be a black hole, and injuries have pushed forward their plans for Devon Travis. The top end of the rotation offers very little for fantasy owners. Dickey is modestly useful in custom leagues where a high innings pitched total has value. The knuckleballer is a good bet to make all his starts and pitch well over 200 innings. Don't count on him recapturing the glory of 2012. Scrolling past Buehrle, we find a nice upside play in Hutchison. The righty was a surprise star last spring, and he turned in a solid season. His 4.48 ERA, 8.97 K/9, and 2.92 BB/9 hint at upside. A deeper dive reveals a good four pitch mix. His 94 mph fastball comes with strong peripherals including a 10 percent whiff rate. His change and slider also rate as plus. He also used a sinker with some frequency last year, but it wasn't a good pitch. Hutchison is a growth asset, and he's priced accordingly. In NFBC drafts, he's the 63rd pitcher off the board. Included in his cohort are Matt Cain, Brandon McCarthy, and Derek Holland. Toronto is leaning towards using him as their opening day starter. Three pitchers are battling for the final two spots. Marco Estrada was acquired in exchange for Lind. The homer-prone fly ball pitcher was originally expected to serve a long relief role. He's teased fantasy owners with a high whiff rate and low walk rate, but they haven't translated to good results. His fastball is too hittable and his curve was terrible last year. He does have a plus change. The other two options are more exciting. Aaron Sanchez features a 97 mph fastball (in relief). His sinker actually outperformed his four seamer in whiff rate and the change flashed elite. He also showed a plus curve. Keep in mind, we're dealing with a small sample size. It's hard to anticipate how he'll perform out of the rotation. Exercise caution. Norris, 22 next month, raced up the org chart last season. He began the year in High-A and ultimately made five appearances in the majors. The lefty has a five-pitch mix and flashed excellent strikeout rates in the minors. He still needs to work on his command and control, which could leave him ticketed for Triple-A. He'll be needed at some point. Remember Johan Santana? He's here too. Cecil emerged as a borderline elite reliever last season. In 53.1 innings, he allowed a 2.70 ERA with 12.83 K/9, 4.56 BB/9, and a 54 percent ground ball rate. The walk rate is an obvious concern, but he's been better in past seasons. The lefty was used situationally, which looks like a big problem at first glance. His stuff actually plays well against righties, although they're also the source of his high walk totals. A big strikeout rate makes him attractive to fantasy owners. Be careful before investing. He's the 35th reliever off the board – one spot after LaTroy Hawkins. At that price, he's a steal. If you feel the need to reach earlier, just be aware that the Jays could go off roster to acquire a ninth inning option. The situation is dire if Cecil doesn't succeed. Aaron Loup appears to be next in line. He's over-exposed as an eighth inning man, let alone as a closer. The Jays are already reaching deep to find alternatives. Neither Miguel Castro nor Roberto Osuna have pitched above High-A ball, yet both are expected to make the opening day bullpen. Castro can hit the upper 90s with his fastball. Osuna has 95 mph heat. They're viewed as starting pitcher prospects. To bump them to the major league bullpen is an indication of the club's desperation. The offense is the life blood of the Blue Jays. The heart of the order includes three of the best right-handed power bats in baseball. 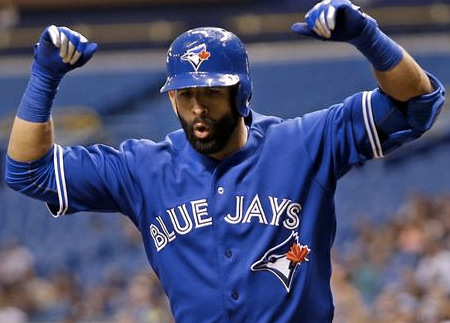 Jose Bautista and Edwin Encarnacion remain elite offensive forces. They're also modest health risks. Donaldson will finally have a hitter's park to call home. The bottom of the order could require some patchwork, but it has decent upside. Speaking of Donaldson, the third baseman hit .255/.342/.456 with a career high 29 home runs while battling late-season injuries. The 29-year-old should provide massive production. He's the second third baseman off the board with the 21st pick. If there's any reason for concern, it's the Rogers Centre turf. Artificial surfaces are often linked to joint discomfort and injury. Since he dealt with hamstring and hip issues last year, I consider him an elevated health risk. Toronto did install a new carpet over the offseason, so maybe the surface won't be too bad. Martin ranks high on my target list among catchers. After a career season that included a .290/.402/.430 line, Russell is expected to bat second most days. He only has 10 to 15 home run power, but his on base skills should lead to a lot of runs scored. He's also the rare catcher who can steal a handful of bases. If you're looking for sleepers, you have options. Travis was expected to open the season in Double-A, but it appears his services are needed in Toronto. It's hard to peg a firm projection for Travis given his lack of experience in the upper minors. Scouts praise his contact ability, so a relative high average with some power and speed is possible. He'll hit near the bottom of the order to start, so don't count on run production. He's only just entering the periphery of fantasy awareness. Toronto has another rookie to watch in the form of Dalton Pompey. To me, he profiles very similarly to Jackie Bradley Jr. as a hitter, which isn't a glowing endorsement. His minor league numbers don't show it, but he has some modest power. He's a decent bet for 30 stolen bases in a full season. He may require further seasoning in the minors. The upside is mixed league relevant, but it's a lot easier to picture the downside. He's available with the 255th pick. Justin Smoak appears ticketed for a shot at regular playing time. Freed of Safeco Field, it's possible we'll see decent power numbers. He's not somebody I would draft outside of the deepest formats. To give an example, I selected him in a 20-team dynasty with something like a 34th round pick. All the same, keep an eye on him. Thanks to a superb offense, the Blue Jays are the ninth team in our power rankings. Any offense headlined by Bautista, Encarnacion, and Donaldson could be special. It gets better - they're supported by Martin and Jose Reyes. The back end of the lineup even has a few upside plays. The pitching staff is an issue. The rotation has a couple fantasy non-entities who provide good real world value. Hutchison and Sanchez could grow this season, or maybe they are what they are. The bullpen could be one of the worst in baseball, especially if guys like Castro and Osuna struggle to adjust.